Sadly, we bid farewell to Captain Morgan and the sailors of the Duke of York this week, as they finally set sail for Hobart and the whaling grounds off Australia. After seven months of his company, it will seem strange to be without him. His constant harping on religion may have got on our nerves from time to time, but he seems to have been an earnest, kindly soul, well-liked by his crew. The early problems with ship-board discipline vanished once they were underway and his habit of consulting his men on some decisions contrasts with what we hear of others. On 20 September he sails out of Nepean Bay, hailed by a fifteen-gun salute from the shore, which he duly returns with seven. Typically he leaves with a blessing, signaling ‘May you live in peace’ as he leaves the bay. ‘We made all sail from this infant settlement’, his diary records, ‘praying this barren land may become a fruitfull field in God’[s] vineyard’. And he adds a lengthy prayer, ‘given me by request from a friend’, for good measure. Much as we might hope otherwise, Captain Morgan’s path will soon be a stormy one. See the note we have added to his biography to read about what happens to him and to the Duke of York. Watching the Duke of York sail out of the bay, Samuel Stephens adds his own prayer for the future of the settlement. His diary ends next week too, so we lose both of our main sources of information on the Kingscote settlement for a time, until others arrive to take up the story. But we do learn this week that Stephens and Charlotte Beare are to marry on 24 September, after which Stephens will go to the mainland. Up at the Lagoon John Brown has much to try him. The merino sheep keep straying away and the fences they have built ‘have become of no use whatsoever’. They must begin again. But the little agricultural village is growing, as some of the women and children arrive and their cottages take shape. Light and his surveying party meanwhile are investigating further around Yankalilla. What they see delights them. ‘I was enchanted with this spot’, Light writes of one valley, ‘it put me in mind of some of the orchards in Devonshire and I found it plentifully supplied with fresh water.’ He is less impressed with some other features. ‘The flies this day for the first time appeared in swarms and were dreadfully annoying’, he records on 21 September. Two days later they are on the move again, searching for a harbour and for fresh water. Light is less impressed with the land a little further north, but consoles himself that the land a few miles inland is much better. On 24 September he anchors near present day Port Adelaide and notes the mangroves ‘growing to the water’s edge’. The Africaine has arrived at the Cape and the passengers all troop on shore with relief. The Thomas family and most of the intermediate passengers stay near the port at a little town called Simon’s Bay, but most of the cabin passengers move on to Cape Town. Mary relishes the change of diet and the chance to walk in the countryside. She also stocks up on oranges and dried fruit, which is plentiful, and buys a ‘quart bottle of genuine cayenne pepper’, some of which she still had some 28 years later. Her description of Simon’s Bay is lively and positive: it was obviously a very welcome break from the ship. The Gougers also enjoy their sojourn at the Cape, although they have very little time for sightseeing. Captain Duff has allowed them only two days in total and most of that is spent in shopping. They succeed in buying some livestock – several goats and fowls to add to the menagerie already on board. (Mary Thomas also acquires some fowls.) 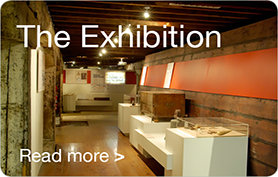 But they do manage to see the little museum and we are told that Mr Slater ‘proposes to found a Museum in S. Australia’. In all Robert Gouger is impressed with Cape Town and with its air of prosperity. So ‘well appointed’ were the houses, he records, that ‘it was not until after some minute investigation that we were able to discover the probable habitations of the labouring people’. On the Buffalo things are going on much as before, with A military exercise in rifle handling. drilling on the decks for the men and occasional dancing in the evenings. Stevenson and Fisher continue in their criticism of Captain Hindmarsh, and we see the beginnings of a strategy to outflank the Governor on arrival in South Australia. A combination of the influence of the Legislative Council and ‘the right direction of public opinion by means of the press’, they think should help to secure ‘good government’. We are reminded that Stevenson intends to combine his duties as private secretary to the governor with that of newspaper proprietor – what we would now see as an extraordinary conflict of interest! 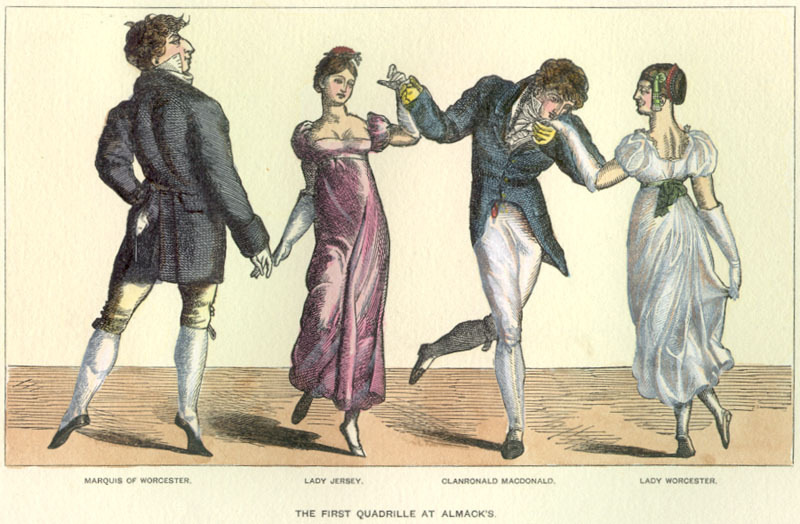 The First Quadrille at Almack's, dated from the Regency Period c. 1800-1810. On the morning of the 20th the “Duke of York” & the “Lady Mary Pelham” sailed with a fair wind for Hobart Town – I parted as I had allways been, very friendly with them both – gave them such instructions, advice, & assistance as I was able – & to the Duke of York I fired a salute of 15 guns in ½ minute time – (I had but one cannon, but it was worked in excellent style) She hove to to receive my salute & returned 7 guns the other ships all hoisting their A flag or standard, especially a military or naval one, indicating nationality. A national flag. Ensigns to the The flag of the South Australian company, which was said to have a Union Jack in the top left corner and three red kangaroos on a blue background. Company’s Flag . Her parting signal which she hoisted when at a long distance was – “Peace be with you”. I answered it from my heart & I fervently pray God’s Blessing may rest upon our Colony. Captain Martin sails for Hobart Town in a day or two & I am busy preparing for him, besides all which I am going Deo Volente – God Willing (D.V.) to be married to morrow & have a few little arrangements to make for that Solemn Ceremony. 21 September-Very warm; out surveying. The flies this day for the first time appeared in swarms and were dreadfully annoying. a luke warmness upon the subject which is truly lamentable. to good government or the social well-being of our colonists. for any thing but the science of discreet government. in the 1 st Cabin. = 4788. Late obs. 5E50′ So. Longe 6E. A A dance performed by four couples. It became popular in England after 1813. quadrille on the The quarter deck was the deck between the main mast and the back of the ship. quarter deck . the second cabin for I am sorry to say they very much disagree. SEPTEMBER 20.-This morning the cliffs of Simon’s Bay were distinctly visible, and gradually increased on the sight. A lofty range of mountains stretched on each side of us, and formed a grand spectacle, and, of course, an agreeable one to all on board, it being exactly twelve weeks since we left London. the labouring emigrants in the use of the A muzzle-loaded, smooth bore long gun, fired from the shoulder. musket . Fine moonlight night. A dance performed by four couples. It became popular in England after 1813. Quadrilles & country dances on deck. SEPTEMBER 21.-This day, Wednesday, about noon, we anchored in Simon’s Bay. A gentleman and lady in the cabin of the name of Hallett, with their family of three children and a servant, joined us in a boat, as they preferred going on shore with us rather than with the cabin party, on account of their family. Some black natives came alongside, and we engaged one of their boats. When we reached shallow water, there being no jetty, we were carried on shore in the arms of the men, to our no small amusement, and my daughter Mary was the first of our party to set foot on Africa. There is a small town here, as they call it, which consisted entirely of one street, or, rather, of one row of houses at the base of tremendous hills and facing the water. The whole much resembled a newly-founded watering-place in England. The inhabitants were chiefly English, with some Dutch, but we saw a great many of the native Africans, quite black, with woolly hair. They took much notice of us, and seemed to be well a ware that we had just arrived from England. A sort of caravan, resembling a London omnibus, drawn by six horses and driven by a Malay with a tremendously long whip, brought the captain and party from Cape Town. I heard one gentleman say that he rode in one drawn by fourteen horses, but they are invariably small, and would bear no comparison with those of England. We likewise saw a light wagon, to which were attached eighteen bullocks. Mr. Thomas purchased some potatoes for seed, and a roll of canvas for a tent to supplement a large one which we had on board…I bought a quart bottle of genuine cayenne pepper for seven-and-sixpence, some of which I have to this day. I mention these things to apprise those who may have forgotten to provide themselves with some such necessary articles, and are fortunate enough to put in at the Cape of Good Hope, that they may be obtained at Simon’s Bay on reasonable terms, and I believe still cheaper at Cape Town. No doubt, in the lapse of time since we were there (nearly twenty-eight years) everything has been greatly improved and the stores are supplied with a greater variety. On the whole we enjoyed ourselves very much, and so well satisfied was our landlord that before we parted he insisted upon our partaking of a bottle of champagne, and wished us a good voyage and prosperity in our new settlement. We had some difficulty in making him understand where it was to be, for at first he imagined that we were bound for Van Diemen’s Land, South Australia being then a new name for the colony, and I believe not till we arrived at the Cape had the inhabitants heard of such an intended settlement. I must here mention the wine called Constantia, which, as our landlord told us, can only be produced in two or three vineyards within a small district where the soil is favourable to the growth of a particular grape from which it is made. It is very rich in flavour, and was indeed a treat to us. It sold at two shillings per bottle. The ordinary Cape wine was sold at a penny per glass. Mr. Hallett’s and our men were on shore drinking it as they did beer in England. It got the better of them, and they continued drinking and smoking nearly all night, making such an intolerable noise that we could not sleep. However, they seemed to enjoy themselves, like their masters, and the next day we treated them to a good breakfast and dinner, with sufficient wine to make them comfortable without being tipsy. They returned to the ship highly gratified. Colonel Light is increasingly anxious as he searches unsuccessfully for the fine harbour recommended by a certain Captain Jones, while the Buffalo finally heads for Rio, after Hindmarsh changes his mind several times.